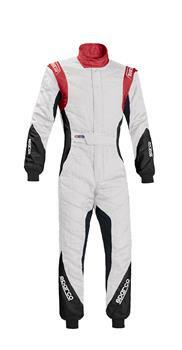 Sparco Racewear - Competition Suit - Eagle RS-8.1 UNIVERSAL - Lesher Motorsports, Inc. The Eagle RS-8.1 suit is made from Hocotex™ and is an evolved version of the current Eagle RS-8. COMPOSITION: NOMEX® antistatic HOCOTEX™ fabric. Single layer sandwich with an average weight of 300/330 g/m². 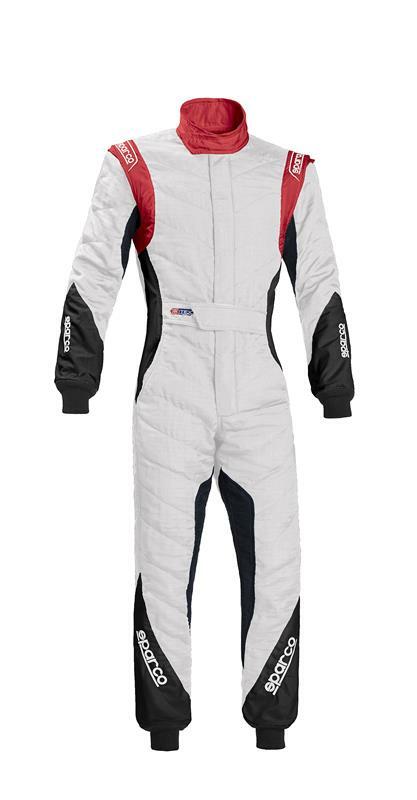 CHARACTERISTICS: The single layer Eagle RS-8.1 suit is made from a breathable, ultra-thin, multi-layer fabric (0.6 mm). Made by pairing Hocotex fabric with other support fabrics including Eagle fabric for the panels at the back, sides and armpits. A tried and tested material with better breathing and resistance properties then traditional jersey. Ultra-thin stitched quilting in classic style reinforced with anti-abrasion material on the legs and arms. Integrated extraction epaulettes. The shoulders, which are compatible with the use of Hans devices, were designed to reduce pressure during races.